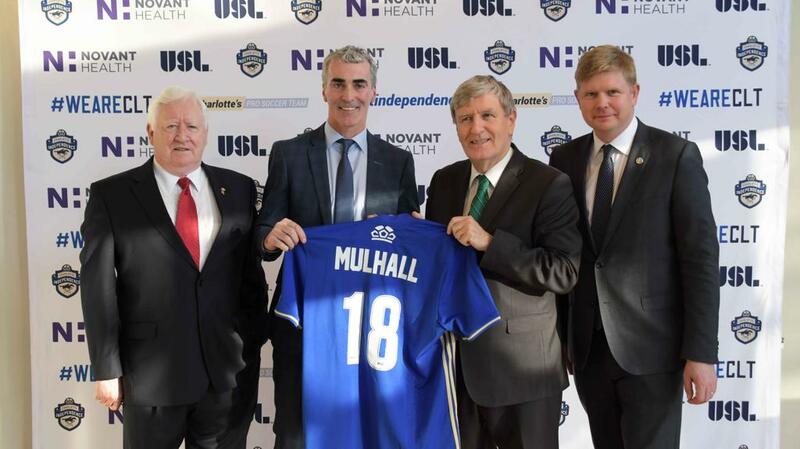 Following his appointment last month as Head Coach of the Charlotte Independence of the United Soccer League (‘USL’), Jim McGuinness was formally welcomed to the United States by His Excellency Daniel Mulhall, Irish Ambassador to the United States. McGuinness has started a 3-year contract as Head Coach of the Charlotte Independence, his first head coach position in professional club football since after switching from Gaelic football. He has previously worked in coaching positions at Glasgow Celtic FC and Beijing Sinobo Guoan FC in the Chinese Super League. Prior to his move to football, McGuinness had a very successful management career in Gaelic Football with Donegal, including the 2012 All-Ireland senior football title. Ambassador Mulhall visited the Charlotte Independence offices to welcome McGuinness on behalf of the Irish community in the US. The Charlotte Independence plays in the Eastern Conference of the USL Championship. The USL is North America's largest professional soccer organisation, overseeing the USL Championship, USL League One and USL League Two. Over 100 clubs participate across the three divisions with massive growth of 95% in attendance between 2014 and 2018. 2.8 million tickets were sold for games in 2018 which is an increase of a third from 2017.